My sister Candy who sometimes writes for this website is moving from Florida to Texas for her husband’s new job. I am proud of them but I’m really going to miss them! They decided not to take the majority of their stuff and to get rid of all but one piece of furniture. We decided to have a yard sale to get rid of most of the stuff they weren’t talking. Our yard sale was highly successful, partly because we posted all of the larger furniture on our local Swip Swap Facebook Ap. People came and got most of the items within an hour of posing them. 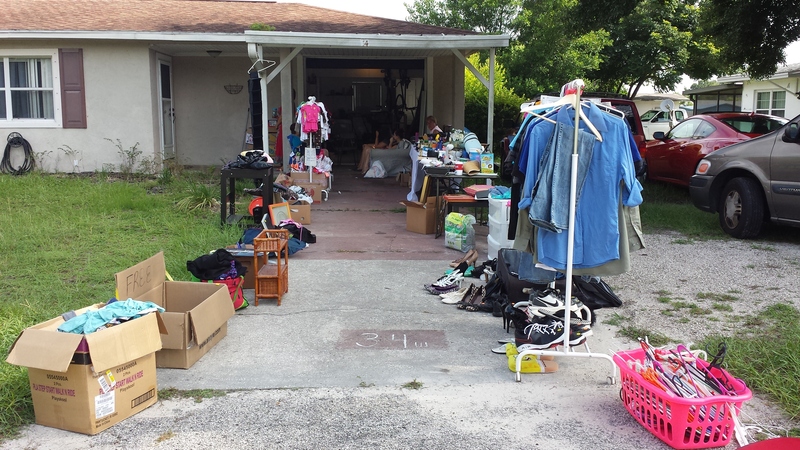 Holding a yard sale at the same time that we posted bigger items for sale online was extremely helpful because people could come at any time during those two days to pick the items up. It also helped that the main objective was to get rid of as much stuff as possible so we priced everything very inexpensively. We also made it clear that people would have to lift and move the furniture out of the house. We were determined that by the end of the two days we would have all of the remaining stuff that we needed to get rid of out of the house and on the driveway for the yard sale. By the end of the two days almost all of the furniture was gone or sold and a lot of the smaller items too. What didn’t sell we planned to have picked up by a local charity or given to family and friends. It turns out that a family we are friends with had recently lost their house and was in need of furniture, clothing and household items and they came and picked up the remaining furniture and stuff. I’m very proud of us that we got rid of so much stuff in such a short period of time and also were able to help out some very nice people.